A year on Mars takes 687 Earth days, almost two full years on Earth. In this time, NASA's Mars Atmosphere and Volatile EvolutioN (MAVEN) mission made some key discoveries about our fascinating red neighbor. October 3 marked the first Martian anniversary of the MAVEN mission, a collaboration between the University of Colorado and NASA. 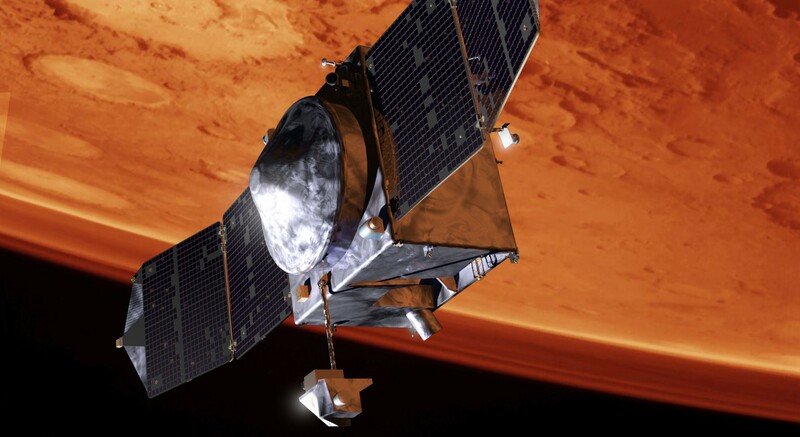 MAVEN's goal is to explore Mars's upper atmosphere, ionosphere, and interactions with the Sun and solar wind. Scientists hope to understand why a planet that once held water no longer can. Evidence of Mars' aqueous history has long captivated the science community. The Martian surface is scored with the telltale signs of water, from channels to minerals. Yet today, nothing remains. Mars's dry atmosphere could once support liquid water on the planet's surface. According to the University of Colorado's MAVEN website: "Scientists have long suspected the solar wind of stripping the Martian atmosphere into space, a process that may have changed Mars from an early, warm and wet environment that might have supported surface life to the cold, arid planet Mars is today." Most complete determination of the rate of loss of gas from the atmosphere to space and of how it is controlled by the sun, both during quiet times and during solar-storm events. Most thorough and accurate determination of the rate of escape of atmospheric gas to space in present time. Most thorough determination of how the sun controls the structure, composition, and variability of the Mars upper atmosphere, leading to escape of gas from the top of the atmosphere to space. Discovery of a cloud of dust surrounding Mars that likely is interplanetary dust (debris from comets) that is falling in toward Mars. Discovery of a layer of metal ions in the ionosphere that comes from the falling in of interplanetary dust. Discovery of diffuse aurorae that are widespread over the planet and that do not depend on the presence of a global or local magnetic field to focus the particles from the sun that drive them. Detection of a “polar plume” of ions escaping to space that had not previously been seen. The MAVEN mission has been extended for an additional two years, with exciting prospects as we enter a different phase in the eleven-year cycle of solar activity. Fact or Science Fiction: How Accurate Are Some of Hollywood’s Most Iconic Sci-Fi Films?